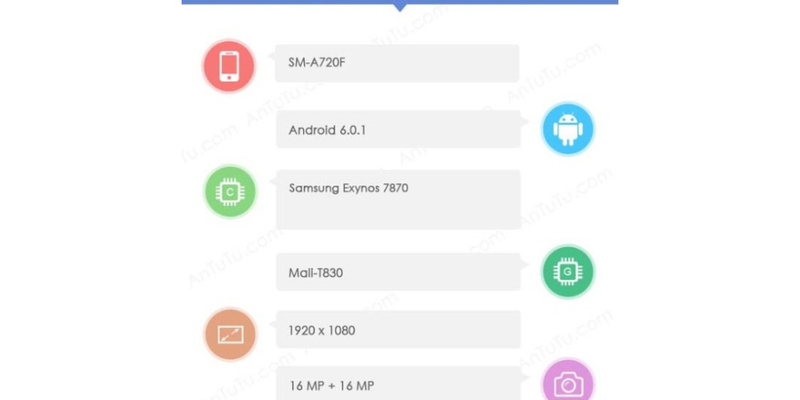 Rumors about the Samsung Galaxy A7 (2017 edition) have been confirmed through an image in the benchmark platform AnTuTu. Through this information we can see what the technical specifications and other features of the smartphone are. A few months ago Samsung decided to start working on its next cell phones by the year 2017, and among them we found the Galaxy A3, A5 and this Galaxy A7. Now, thanks to a leak that comes through AnTuTu, we could learn enough information about the Galaxy A7 (2017), the most important model of the successful A series, aimed at an audience interested in the medium-high and mid-range. The Samsung Galaxy A7 shows a very interesting hardware and some pretty unexpected details from the specifications. In the center of this new Android smartphone we found an Exynos 7870 processor along with a Mali T830 graphics processor, which will facilitate the work of the cell phone with 3 GB of RAM; from this section also we find 64 GB of internal storage. The numbers seem quite suitable for medium range device; however, the Galaxy A7 will also feature an amazing front camera of 16 megapixels, the same that we find in the back of the device. A very good solution for those who buy a smartphone considering first this factor as a determinant. This could be translated into a smartphone with a strong vocation in the image, especially as mid-range device, capable of handling high resolutions, videos and bright colors thanks to a 5.5-inch screen Super AMOLED HD. The default operating system that will run everything is Android 6.0.1 Marshmallow, that just arrived to the current version of the Galaxy A7 in Europe. It is still not clear, according to AnTuTu benchmarks, if the Galaxy A7 (2017) will be officially launched later this year; in any case, the most likely date seems to have been postponed until next year when we can also see the new flagship Galaxy S8, which will try to give some joy and success to the Korean company after the unfortunate incident with the Galaxy Note 7.